Check out the birdstore blog. The Sunday Bird Walk went to Buttertubs Marsh in Nanaimo. The outstanding highlight of the morning was the sighting of three Virginia Rails and we heard the call of a Sora. We saw several Yellow-rumped Warblers, Tree and Violet-green Swallows hawking insects and three Turkey Vultures soaring high in the sky. Canada Goose, Mallard, Ring-necked Ducks, Hooded Mergansers, a Pied-billed Grebe, Wood Duck, Glaucous-winged Gull, Great Blue Heron, Turkey Vulture, Virginia Rail, Sora, American Coot, Rock Pigeon, Belted Kingfisher, Northern Flicker, Downey Woodpecker, Common Raven, Tree Swallow, Violet-green Swallows, Chestnut-backed Chickadees, Bushtits, Brown Creepers, Winter Wren, Bewick's Wren, Marsh Wren, Ruby-crowned Kinglets, Yellow-rumped Warbler, American Robin, European Starling, Spotted Towhee, Song Sparrow, Fox Sparrow, Golden-crowned Sparrow, Red-winged Blackbird, Purple Finch, Dark-eyed Junco, House Finch, Pine Siskin, American Goldfinch and House Sparrow. A Rufous Hummingbird, Downy and Hairy Woodpeckers, Northern Flickers, two Pileated Woodpeckers, a Sharp-shinned Hawk, California Quail, Pine Siskins are frequenting a yard along Lancewood Avenue in Lantzville and two Barred Owls are calling at night. Over 5,000 Barrow's Goldeneye's in two hugh rafts were seen just outside Boat Harbour south of Cedar. several Red Crossbills on the beach just in front of us and Golden-crowned Kinglets kept us entertained as they hawked insects on the low bushes along the forest trails. Brant, Mallard, Greater Scaup, Surf Scoter, White-winged Scoter, Black Scoter, Long-tailed Duck, Common Goldeneye, Common Merganser, Red-breasted Merganser, Pacific Loon, Common Loon, Horned Grebe, Red-necked Grebe, Brandt's Cormorant, Double-crested Cormorant, Pelagic Cormorant, Great Blue Heron, Turkey Vulture, Bald Eagle, Black Oystercatcher, Mew Gull, California Gull, Thayer's Gull, Glaucous-winged Gull, Common Murre, Northern Flicker, Pileated Woodpecker, Northwestern Crow, Common Raven, Chestnut-backed Chickadee, Red-breasted Nuthatch, Brown Creeper, Bewick's Wren, Winter Wren, Golden-crowned Kinglet, American Robin, Varied Thrush, European Starling, Spotted Towhee, Song Sparrow, Purple Finch, Red Crossbill and Pine Siskin. 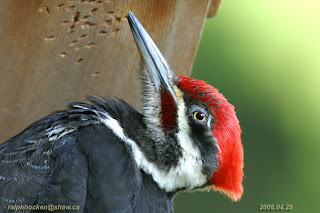 A Pileated Woodpecker is visiting suet feeders along Pheasant Terrace in Nanaimo. A partial Albino American Robin was seen at Deep Bay. Over fifty Violet-green Swallows, a Northern Shrike, a Greater Yellowlegs and seven Western Meadowlarks were seen at the Nanaimo River Estuary in south Nanaimo. Both Anna's and Rufous Hummingbirds are coming to feeders in the 4600 block of Lost Lake Road in Nanaimo. A Rufous Hummingbird has returned to feeders along Gary Oaks Drive in Nanoose Bay. Monday March 31, 2008@ 7:30 pm. Everyone is welcome to join us for a 2-3 hour bird walk on the Sunday and Wednesday mornings. We leave from the Store at 9 A.M. Sunday Mornings and go to a different location in and around Nanaimo and from the Parksville Visitor Centre in Parksville at 9 A.M. Wednesdays and go to different areas in and around the Oceanside area. The Wednesday Bird Walk on April 02, 2008 will be going to the Englishman River Estuary, Plummer Road side in Parksville. We will meet at the Parksville Visitor Centre at Highway 19A and Northwest Bay Road, near Craig Bay in Parksville, at 9:00 A.M. or at the corner of Plummer Road and Shorewood Drive at about 9:10 A.M. The Sunday Bird Walk on April 06, 2008, will be going to the Nanaimo River Estuary in south Nanaimo. 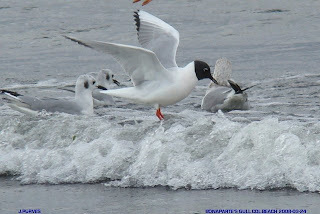 Meet at the Bird Store at 9:00 A.M. or at the end of Raines Road at about 9:30 A. M.
Bonapart's Gull: John Purves Photo. The Wednesday Bird Walk went to Rathtrevor Provincial Park in Parksville. Ten birders found forty-five species of birds. The highlights of the morning included the sighting of the first Turkey Vulture of the season. We saw steady streams of Black, Surf, White-winged Scoters and Long-tailed Ducks flying up and down the Strait of Georgia. A large raft of Red-breasted Mergangers and Long-tailed Ducks were seen not far from shore. We saw several Red-crossbills on the beach in front of us and Golden-crowned Kinglets kept us entertained as they moved very quickly and hawked insects on the low bushes along the forest trails. The Backyard Wildbird & Nature Store's weekly bird walk in the Parksville/Qualicum Beach area is on Wednesday mornings at 9 a.m. Participants meet at the Parksville Visitor Centre at Highway 19A and Northwest Bay Road in Parksville at 9:00 A.M. Snow, rain and/or heavy winds will deter us--but we will plan a walk for every week. Everyone is welcome to bring their binoculars and join us for a morning of birding. For the weekly location of the birdwalk, please call Neil Robins at (250) 954-1928 or the Backyard Wildbird and Nature Store at (250) 390-3669. A Rufous Hummingbird and a Golden-crowned Sparrow were seen along Morrell Circle in Nanaimo. A Rufous Hummingbird was seen visiting feeders in the 200 Block of Dawkins Lane in Nanaimo. An Orange-crowned Warbler and a flock of Bushtits were seen at Transfer Beach Park in Ladysmith. Two Cackling Geese were seen along Doole Road in Yellow Point. A Great-horned Owl was heard calling near Jack's Point in Cedar. A Rufous Hummingbird was seen visiting feeders in the 7000 block of Aulds Road in Nanaimo. Two Turkey Vultures were seen flying above Linley Valley in Nanaimo. An Albino American Robin was seen with other American Robins on a lawn in French Creek. A Red-breasted Sapsucker was seen feeding on a Western Red Cedar at the top of Summit Drive on Long Lake Heights in Nanaimo. The Wednesday Bird Walk went to Columbia Beach near French Creek. Twelve birders found forty-three species of birds. The highlights of the morning included the sighting of two flocks of Trumpeter Swans flying up the Strait of Georgia and one Pigeon Guillemot with a small flock of Common Murres heading down the Strait. A large raft of Surf Scoters, Long-tailed Ducks, Pacific Loons and Brandt’s, Pelagic and Double-crested Cormorants were seen in the choppy water not far from shore. We spotted several Western Gulls in with the thousands of gulls on the gravel bars near shore. Twelve birders found the following forty-three species. White-crowned Sparrow, Golden-crowned Sparrow, Purple Finch, House Finch, Pine Siskin and House Sparrow. A Brown Pelican was spotted at the Ladysmith Harbour flying west over the Highway in Ladysmith. A Rufous Hummingbird was seen along Fawcett Road in Cedar. A Western Screech Owl was heard calling at McGregor Marsh in north Nanaimo. A Yellow-rumped Warbler was seen along Ermineskin Avenue in Parksville. A Rufous Hummingbird was visiting feeders in the 2800 block of Shady Mile Way in Nanaimo. An immature Glaucous Gull was spotted at Somenos Marsh in Duncan. A Townsend's Solitare was seen feeding on Mountain Ash berries at Fairwinds in Nanoose Bay. A low flying Turkey Vulture was seen over a home at Fairwinds in Nanoose Bay. 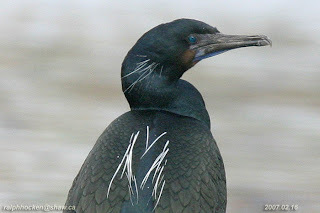 Three Hooded Mergangers were seen at Buttertubs Marsh in Nanaimo. The Wednesday Bird Walk on March 26, 2008 will be going to Rathtrevor Provincial Park in Parksville.We will meet at the Parksville Visitor Centre at Highway 19A and Northwest Bay Road, near Craig Bay in Parksville, at 9:00 A.M. or at the main parking lot at Rathtrevor Park at about 9:10 A.M. Please note there is a parking fee at Rathtrevor Provincial Park. The Sunday Bird Walk on March 30, 2008, will be going to Buttertubs Marsh in Nanaimo. 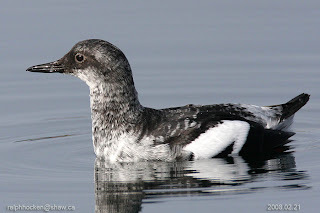 Meet at the Bird Store at 9:00 A.M. or at the parking lot off Bowen Road at about 9:20 A. M.
Pigeon Guillemot: Ralph Hocken Photo. Violet-green Swallows were seen over Diver Lake in Nanaimo. Twenty Trumpeter Swans were seen in the near fields of the Ugly Dwarf Meadows in Nanoose Bay. Crow, Varied Thrush, American Robin, European Starling, Red-winged Blackbird, Spotted Towhee, Song Sparrow, Fox Sparrow, House Finch, Purple Finch, Red Crossbill and Pine Siskin. Two Greater Yellowlegs and a pair of Wood Ducks were seen at French Creek. Large rafts of seabirds including Brandt Geese, Bufflehead, Surf, White-winged and Black Scoters, Pelagic, Double-crested and Brandt's Cormorant, sixty Bald Eagles and thousands of Gulls were seen off Boat Harbour south of Cedar. Two Canvasback Ducks were seen on Quamichan Lake in Duncan. A Western Screech Owl was heard calling near the main marsh at McGregor Marsh in north Nanaimo. Yellow-rumped Warblers, Marsh Wrens, Tree Swallows and a Turkey Vulture were seen at Buttertubs Marsh in Nanaimo. The Wednesday Bird Walk went to the Little Qualicum River Estuary in Qualicum Beach. Eleven birders found fifty-one species of birds. There were huge rafts of thousands of sea ducks, including Brant Geese, Greater Scaup, Harlequin Duck, Surf Scoter, White-winged Scoter, Black Scoter, Long-tailed Duck, Bufflehead, Common Goldeneye, Barrow's Goldeneye, Common Merganser, Red-breasted Merganser, Pacific Loon and Common Loon off the Viewing Tower in Qualicum Beach. 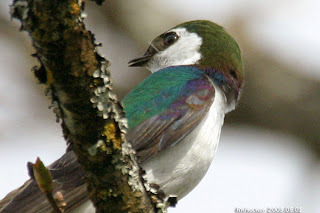 Another great highlight of the morning was the sighting of approximately two hundred Violet-green Swallows and Tree Swallows hawking insects just above the Little Qualicum River. A true sign that spring is just around the corner. Canada Goose, Brant, Trumpeter Swan, Eurasian Wigeon, American Wigeon, Mallard, Northern Pintail, Green-winged Teal, Greater Scaup, Harlequin Duck, Surf Scoter, White-winged Scoter, Black Scoter, Long-tailed Duck, Bufflehead, Common Goldeneye, Barrow's Goldeneye, Common Merganser, Red-breasted Merganser, Pacific Loon, Common Loon, Horned Grebe, Red-necked Grebe, Brandt's Cormorant, Double-crested Cormorant, Pelagic Cormorant, Great Blue Heron, Bald Eagle, Merlin, Killdeer, Black Oystercatcher, Black Turnstone, Bonaparte's Gull, Mew Gull, Ring-billed Gull, California Gull, Herring Gull, Thayer's Gull, Glaucous-winged Gull, Belted Kingfisher, Northwestern Crow, Common Raven, Tree Swallow, Violet-green Swallow, American Robin, European Starling, Spotted Towhee, Song Sparrow, Red-winged Blackbird, Brewer's Blackbird and Purple Finch. 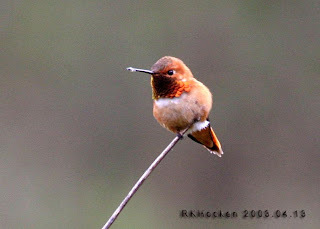 Rufous Hummingbird are coming to feeders along Forest Crescent in Nanaimo and the Yellowpoint area of Cedar. Barn Owls were seen in the Yelllowpoint area of Cedar. One Evening Grosbeak was seen in with a flock of Pine Siskins in the woods near the Coombs Country Market in Coombs. Several Trumpeter Swans were seen flying over Parksville. A male Rufous Hummingbird was visiting feeders along Walton Heath Place in Nanaimo. The Wednesday Bird Walk on March 12, 2008 will be going to Columbia Beach We will meet at the Parksville Visitor Centre at Highway 19A and Northwest Bay Road, near Craig Bay in Parksville, at 9:00 A.M. or at the parking area on Admiral Tyron Boulevard off Columbia Drive in French Creek at about 9:20 A.M. There will be no Sunday Bird Walk on March 23, 2008. Happy Easter. The Sunday bird walks will resume on March 30. 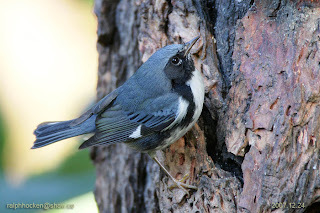 Black-throated Blue Warbler along Cross Road in Nanoose Bay: Ralph Hocken Photo. The Wednesday bird walk went to the Little Qualicum River Estuary in Qualicum Beach. Eleven birders found fifty-one species of birds. Off the Viewing Tower in Qualicum Beach there were huge rafts of thousands of sea ducks, including Brant Geese, Greater Scaup, Harlequin Duck, Surf Scoter, White-winged Scoter, Black Scoter, Long-tailed Duck, Bufflehead, Common Goldeneye, Barrow's Goldeneye, Common Merganser, Red-breasted Merganser, Pacific Loon and Common Loon. Another great highlight of the morning was the sighting of approximately two hundred Violet-green Swallows and Tree Swallows hawking insects just above the Little Qualicum River. A true sign that spring is just around the corner. Eleven birders found the following fifty-one species. The Sunday Bird Walk went to the Little Qualicum River Estuary. Among the highlights were the sighting of at least 30,000 seabirds off shore at the Viewing Tower in Qualicum Beach. At the Little Qualicum River Estuary we estimated that we saw over 40,000 seabirds fly by for about thirty minutes. There were White-winged and Surf, Scoters, Long-tailed Ducks, Common and Barrow's Goldeneye, Brandt's, Pelagic and Double-crested Cormorants. Off shore we spotted approximately 2,000 Common Murres. Just past the sand bar on the water, there was a flock of at least 1,000 Red-breasted Mergangers. The herring spawn last week certainly attracted the seabirds to the area! American Wigeon, Eurasian Wigeon, Red-breasted Merganser, Common Merganser, Common Murre, Bald Eagle, Dunlin, Black Oystercatcher, Killdeer, Black Turnstone, Mew Gull, California Gull, Western Gull, Bonaparte's Gull, Thayer's Gull, Ring-billed Gull, Glaucous-winged Gull, Belted Kingfisher, Hairy Woodpecker, Northern Flicker, Common Raven, Northwestern Crow, American Robin, European Starling, Brewer's Blackbird, Red-winged Blackbird, Spotted Towhee, Song Sparrow, Dark-eyed Junco, House Finch, Purple Finch, Red Crossbill and Pine Siskin. Three Snow Geese were seen above Highway 19A and Resort Way in Parksville. Twenty-four Snow Geese were seen flying over south Nanaimo. An Orange-crowned Warbler has been visiting feeders since January 08, 2008, at MacLeary Street and Bowen Road in Nanaimo. Four Violet-green Swallows were seen over Cathers Lake in Nanaimo. A Rufous Hummingbird is visiting feeders along Kenwill Drive in north Nanaimo. Two large flocks of Trumpeter Swans and a Turkey Vulture were seen over Morrell Circle in Nanaimo. A Violet-green Swallow and Steller's Jays were seen along Morrell Circle. Barred Owls were calling and a pair of Pine Siskins were collecting dog hair near Colliery Dam Park in the 800 block of Harewood Mines Road in Nanaimo. At least twenty Violet-green Swallows were spotted flying above the ponds at Buttertubs Marsh in Nanaimo. A Townsend's Warbler was heard calling from the tops of fir trees, along with Red crossbills and flocks of Pine Siskins in the Harewood Plains just south of Harewood Mines Road in Nanaimo. A Chukar was seen in the 700 block of Primrose Street in Qualicum Beach. A White-throated Sparrow is visiting feeders in the 100 block of Green Lake Crescent in Nanaimo. Evening Grosbeaks were seen along Gomerich Road and Scottown in south Wellington. continually hawked insects from the trees. We watched as a Red-breasted Sapsucker tapped into a tall Popular Tree, seeking sap. Chickadee, Bushtit, Red-breasted Nuthatch, Brown Creeper, Bewick's Wren, Winter Wren, Golden-crowned Kinglet, Ruby-crowned Kinglet, American Robin, Varied Thrush, European Starling, Spotted Towhee, Fox Sparrow, Song Sparrow, Golden-crowned Sparrow, Dark-eyed Junco, Red-winged Blackbird, Purple Finch, House Finch, Red Crossbill and Pine Siskin . In Parksville from Soriel Road, looking over Parksville Bay, thousands upon thousands of Gulls, Black, White-winged and Surf Scoters, Common and Barrow's Goldeneye, Greater Scaup, Long-tailed Ducks can be seen. The water near the shore has turned aqua-blue and the Herring Spawn is on. The sight is awesome--the yearly natural phenomenon has begun again!!!! Two Barred Owls were heard talking and calling in the 800 block of Harewood Mines Road at Colliery Dam Park in Nanaimo. The Wednesday Bird Walk on March 12, 2008 will be going to the Little Qualicum River Estuary, in Qualicum Beach. We will meet at the Parksville Visitor Centre at Highway 19A and Northwest Bay Road, near Craig Bay in Parksville, at 9:00 A.M. or at the Viewing Tower at highway 19a and Garrett Road in Qualicum Beach at about 9:20 A.M. The Sunday Bird Walk on March 16, 2008 will be going to Neck Point Park in Nanaimo. We will meet at the Bird Store at 9:00 a.m. or at the parking area at Neck Point Park about 9:20 a.m. The Wednesday Bird Walk went to the Englishman River, Shelly Road side in Parksville. Thirteen birders found fifty-two species of birds. 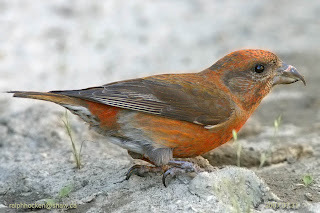 Among the highlights of the morning were the sightings of several Red Crossbills, some within close view just ahead of us on the path. A pair of Barred Owls entertained us a couple of times during the morning walk with their very loud calls sounding like "Who Cooks for You-Who Cooks for You". Several Ruby-crowned Kinglets and Golden-crowned Kinglets kept our eyes constantly moving as they continually hawked insects from the trees. We watched as a Red-breasted Sapsucker tapped into a tall Popular Tree, seeking sap. 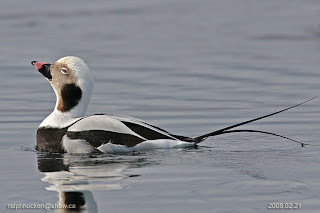 Brant at Parksville: Ralph Hocken Photo. The Sunday Bird Walk went to Nanoose Bay Estuary. Among the highlights were the sighting of three Red-tailed Hawks soaring in the sky. We had the unusual sightings of a Ring-billed Gull, California Gull and an Eurasian Wigeon on the estuary. American Wigeon, Eurasian Wigeon, Red-breasted Merganser, Common Merganser, Bald Eagle, Red-tailed Hawk, Northern Harrier, Peregrine Falcon, Killdeer, Mew Gull, California Gull, Thayer's Gull, Ring-billed Gull, Glaucous-winged Gull, Belted Kingfisher, Pileated Woodpecker, Northern Flicker, Common Raven, Northwestern Crow, Bewick's Wren, Winter Wren, American Robin, European Starling, Red-winged Blackbird, Spotted Towhee, Song Sparrow, House Finch, Purple Finch, Red Crossbill and Pine Siskin. Fourteen Trumpeter Swans were seen in the far fields at the Ugly Dwarf Meadows at Nanoose Bay. Large rafts of seabirds, including Black, Surf and White-winged Scoter, Common and Red-breasted Merganser, Greater Scaup, Pelagic Cormorant and Common and Barrow's Golden-eye, were seen looking over Parksville Bay from Doehle Avenue in Parksville. A White-throated Sparrow is visiting a yard along Green Lake Crescent in north Nanaimo. 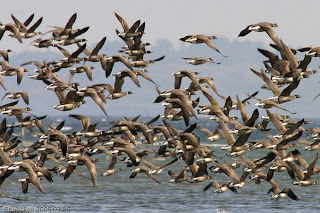 About 300 Brant were seen along the beach at Rathtrevor Provincial Park in Parksville. 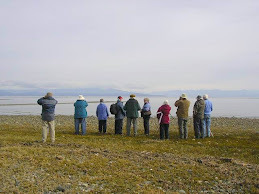 The Wednesday Bird Walk went to Rathtrevor Provincial Park in Parksville. Seven birders found forty-two species of birds. Among the highlights were the sightings of fifteen different flocks of Common Murres, with fifty to sixty Murres in each flock, heading down the Strait of Georgia. A flock of about one thousand Dunlin made a brief appearance for us all to have a look at them and two Black Oystercatchers stopped on the tide line about twenty feet from us. The Brant Geese are beginning to arrive. We saw about two hundred of them during the morning walk. Brant, American Wigeon, Mallard, Northern Pintail, Surf Scoter, White-winged Scoter, Black Scoter, Common Goldeneye, Common Merganser, Pacific Loon, Common Loon, Horned Grebe, Double-crested Cormorant, Pelagic Cormorant, Bald Eagle, Black-bellied Plover, Black Oystercatcher, Dunlin, Mew Gull, California Gull, Thayer's Gull, Glaucous-winged Gull, Common Murre, Northern Flicker, Northwestern Crow, Common Raven, Chestnut-backed Chickadee, Red-breasted Nuthatch, Brown Creeper, Bewick's Wren, Winter Wren, Golden-crowned Kinglet, Ruby-crowned Kinglet, American Robin, Varied Thrush, European Starling, Spotted Towhee, Song Sparrow, Dark-eyed Junco, Red Crossbill, Pine Siskin and American Goldfinch. In Parksville, from Soriel Road overlooking Parksville Bay, thousands upon thousands of Gulls, Black, White-winged and Surf Scoters, Common and Barrow's Goldeneye, Greater Scaup, Long-tailed Ducks can be seen. The water near the shore has turned aqua-blue and the Herring Spawn is on. The sight is awesome--the yearly natural phenomenon has begun again!!!! Monday March 24, 2008@ 7:30 pm. The Wednesday Bird Walk on March 05, 2008 will be going to the Englishman River Estuary, Shelly Road side in Parksville. We will meet at the Parksville Visitor Centre at Highway 19A and Northwest Bay Road, near Craig Bay in Parksville, at 9:00 A.M. or at the end of Shelly Road at about 9:10 A.M. The Sunday Bird Walk on March 09, 2008 will be going to Little Qualicum River Estuary. We will meet at the Bird Store at 9:00 a.m. or at the Viewing Tower near Garrett Road and Highway 19A at about 9:30 a.m.